Since finding Dr. Felton & his excellent crew, for the first time in my life, I am no longer worried about going to the dentist’s office! Everyone is so kind & patient. It truly is a relief to be able to look forward to my appointments!!. My journey lasted just over a year from the initial examination to completion. Throughout the entire process I was treated professionally, respectfully, and personally with each visit to Dr. Felton’s office. If you are contemplating implants or getting dentures I highly recommend Dr. Felton and Felton Dental Care. Looking back on the whole adventure, it was worth every minute to finally have a smile again. It has changed my life just as Dr. Felton said it would. 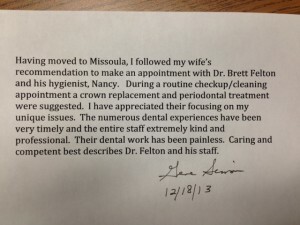 Click here to read Ron’s full description of his experience getting dental implants and dentures from Missoula dentist Dr. Brett Felton. “My Invisalign results were even better than I anticipated. My crooked bottom teeth were causing pain and my bite alignment was getting worse. Dr. Felton was able to show me my specific plan by a computer simulation before I began the process. I even had my husband come in to see it. Using Invisalign, Dr. Felton gently and steadily moved my teeth to their correct position. Dr. Felton’s attention to detail and his thoroughness in explaining the progress in each visit lessened my natural anxiety. Also, I quickly became use to wearing the aligners. I love my results and I highly recommend Dr. Felton. Invisalign is a great product and Dr. Felton is skilled and experienced in its application. Also, no one knew I was doing Invisalign unless I chose to tell them! “Every check-up and procedure with Dr. Felton and his warm, caring staff was a comfortable experience with very positive results. 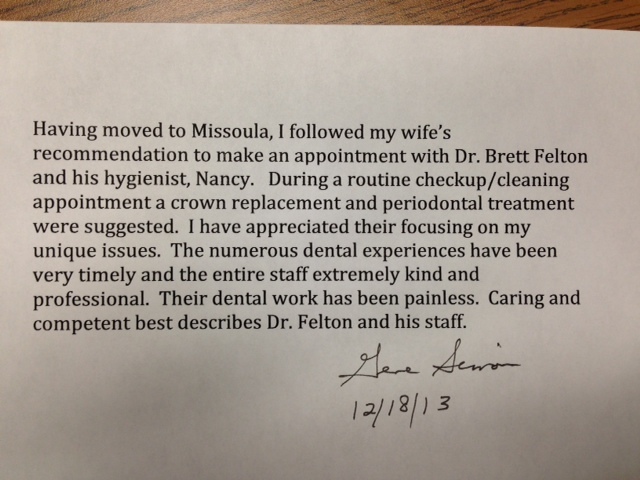 I do recommend Dr. Felton…This is painless dentistry! !